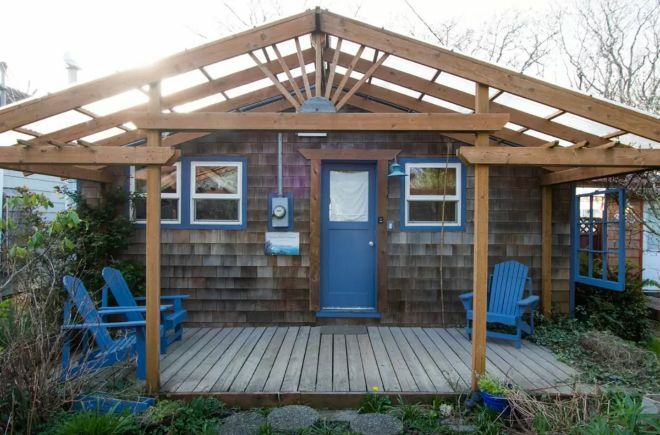 As far as beachside cottages go, few measure up to the original design that this lovely place boasts. 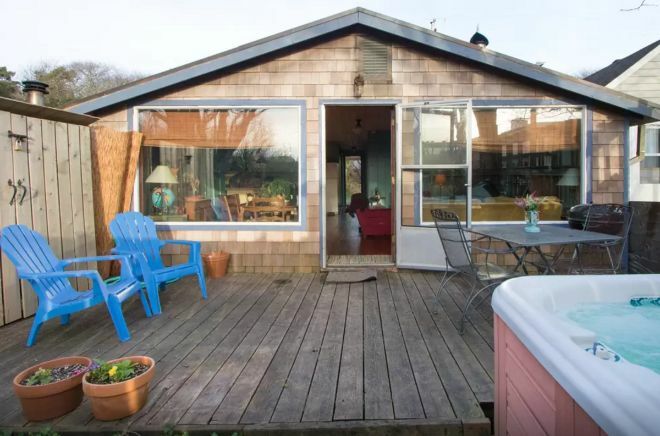 Located just near Rockaway Beach, a mere two hours away from Portland, Oregon, this vacation home has everything you could need from a getaway spot while still sporting a unique, vintage look. 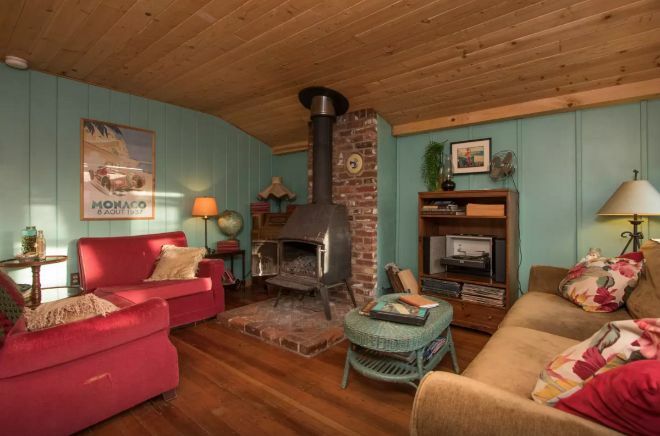 That's because this is a renovated 1940s home. 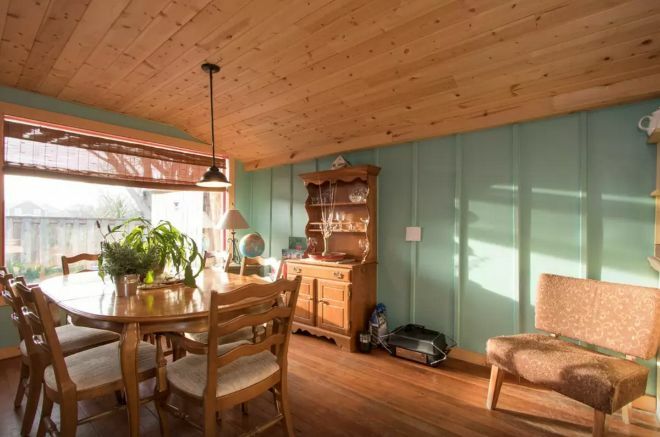 The Airbnb listing describes this place as having been restored to its original look, complete with a quirky, colorful feel. The unlikely color associations give it just the right amount of old-fashioned charm while still looking fairly up-to-date with the times. The house's facade is wonderfully original. Its glass cover above the front porch gives the house an almost unfinished look when seen from certain angles. 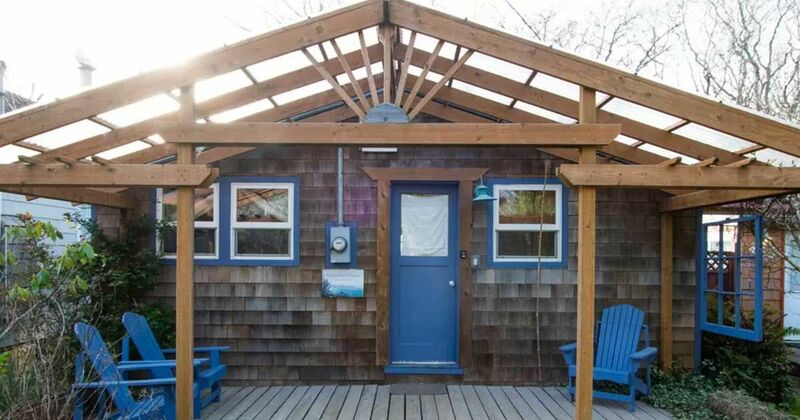 The front door, lawn chairs and windows are all the same vibrant shade of blue. The living room meshes complementary colors very nicely, the red couches and cushions battling it out with the pale green walls and coffee table. The hardwood floors, paneled ceiling and brick fireplace complete the color battle with their warm brown hues. Most of the house boasts an unusual sloped ceiling that bends downward on the sides, giving every room a fun shape. Plenty of light shines in from the window near the dining table. 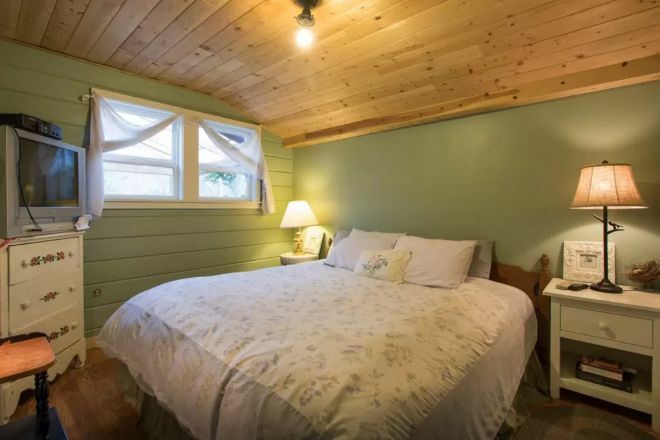 The bedroom also uses the same green walls and wooden floors and ceiling as the living room, with mainly white furniture to further punctuate the color scheme. 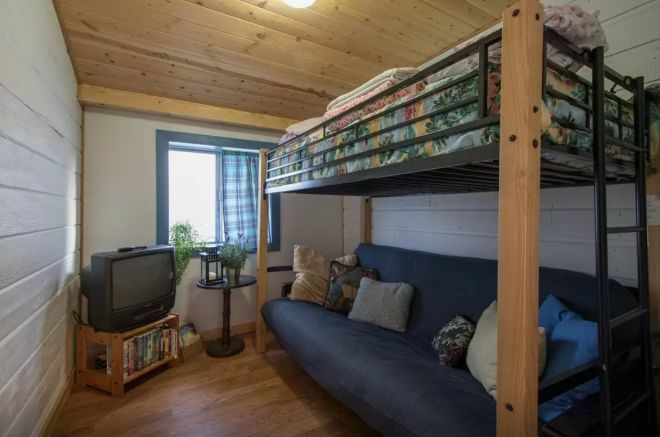 A second bedroom features an elevated bed above a foldout futon, with blue hues reminiscent of the house's facade. 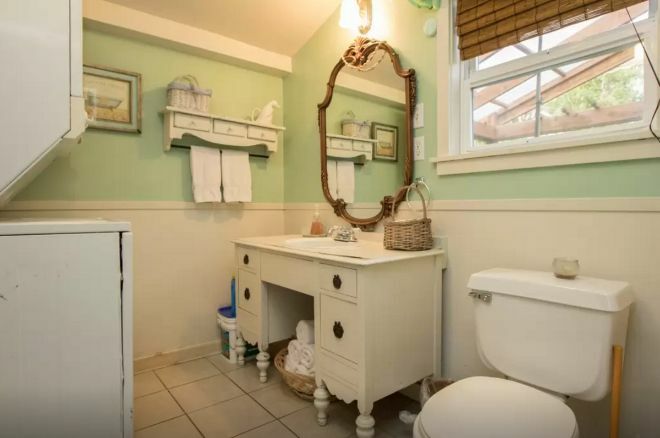 A strip of pale green breathes life into this otherwise very white bathroom, with the mirror and blinds adding another touch of color. 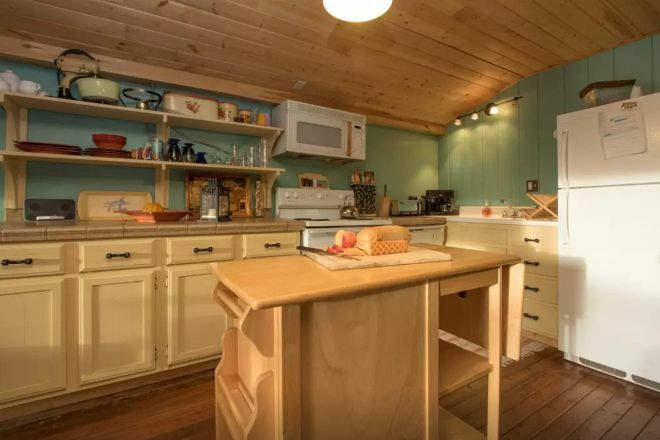 The common area features a wooden kitchen complete with an island. An elevated micro-wave oven is featured above the stove, and shelves replace the usual cabinetry found above the counter. The backyard allows guests to relax in privacy, with lawn chairs and another dining table. The windows into the living room are massive for the best possible exposure to light. 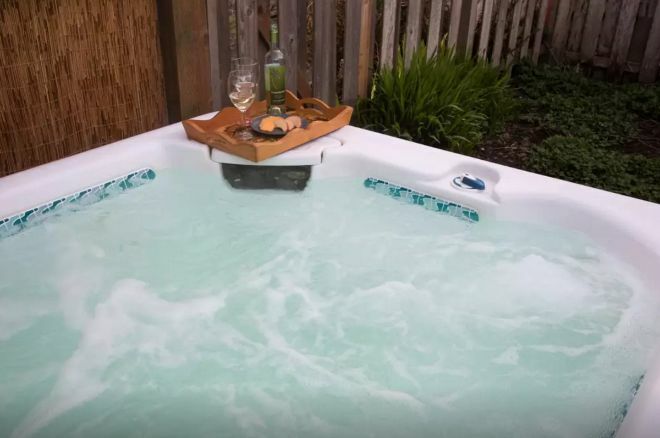 And perhaps the cherry on the cake for this house – your very own hot tub. What else is there to add? Share this beautiful vacation home with your friends if you enjoyed it!